Apple season is officially here (!!) 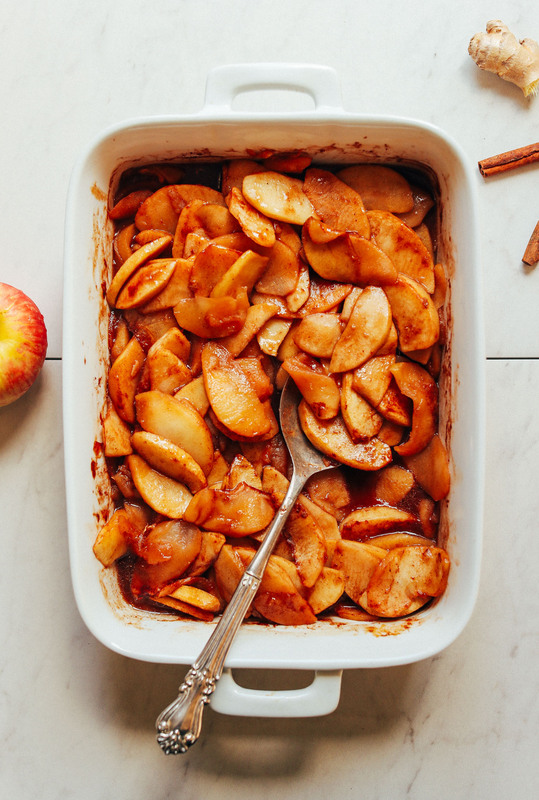 and I’ve been dreaming about this baked apple recipe for a while now. Dreams came true in my kitchen when I opened up the oven to see these tender, cinnamon-coated, perfectly caramelized apples! Let me show you how. Coconut sugar provides a slightly caramelized flavor I adore. All that’s left is lemon juice and sea salt to balance out the sweetness and a touch of cornstarch or arrowroot to ensure the sauce thickens up nicely. Forty-five minutes in the oven covered then another 10 uncovered and you’re in cinnamon-apple paradise. 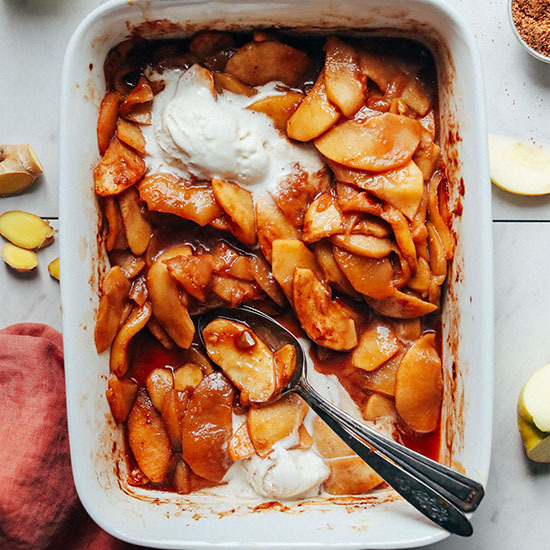 These apples are perfect on their own, but they are extra dreamy with a scoop of Vanilla Bean Coconut Ice Cream or Coconut Whipped Cream. 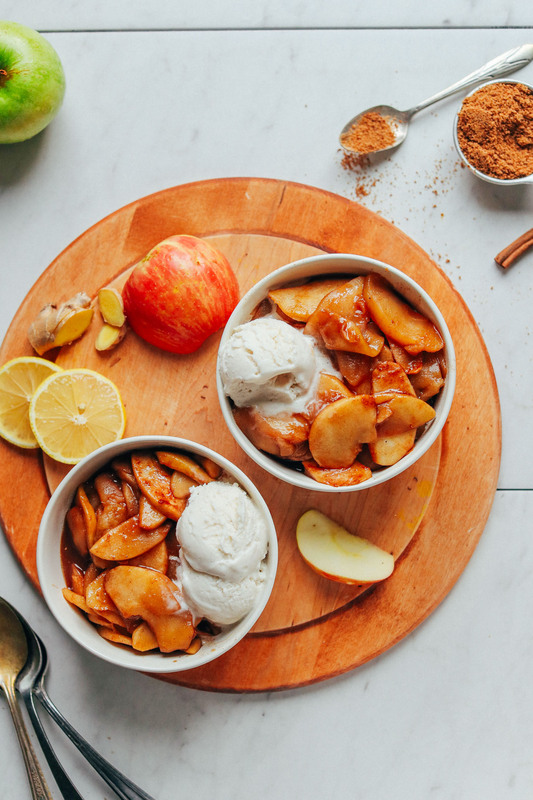 For more apple recipes, be sure to check out our Pumpkin-Spice Apple Pie, Apple Pie Crumble Bars, Apple Pecan Arugula Salad, The Best Vegan Apple Crisp, Vegan Pumpkin Apple Muffins, Apple Gingerbread Cake, Apple Pie Date Bars, and Vegan Apple Cinnamon Waffles! If you try this recipe, let us know! Leave a comment, rate it, and tag a photo #minimalistbaker on Instagram! We’d love to see what you come up with. Cheers, friends! Easy Cinnamon Baked Apples requiring simple ingredients, 1 bowl, plus naturally sweetened! The perfect grain- and gluten-free plant-based dessert for the holidays and beyond! Preheat oven to 350 degrees F (176 C) and set out a 9x13-inch (or similar size) baking dish. Enjoy as is or with Coconut Whipped Cream or Vanilla Bean Coconut Ice Cream! Best when fresh, though leftovers keep covered in the refrigerator up to 3-4 days or in the freezer up to 1 month. Reheat in the microwave or in a 350-degree F (176 C) oven (covered) until warmed through. Add a bit of water if the "caramel" sauce is too thick. *You can sub 1/2 tsp ground ginger per 3/4 tsp fresh ginger. *Nutrition information is a rough estimate calculated without sides or toppings, calculated without the coconut oil and apple juice. Making these this morning to put on pancakes. I had two apples I did not know what to do with. Not fresh enough to eat. Thanks for the recipe. These baked apple turned out to be a staple on our fridge this week. I’ve made this recipe 3 times in the last 10 days. It is easy and quick to make it. 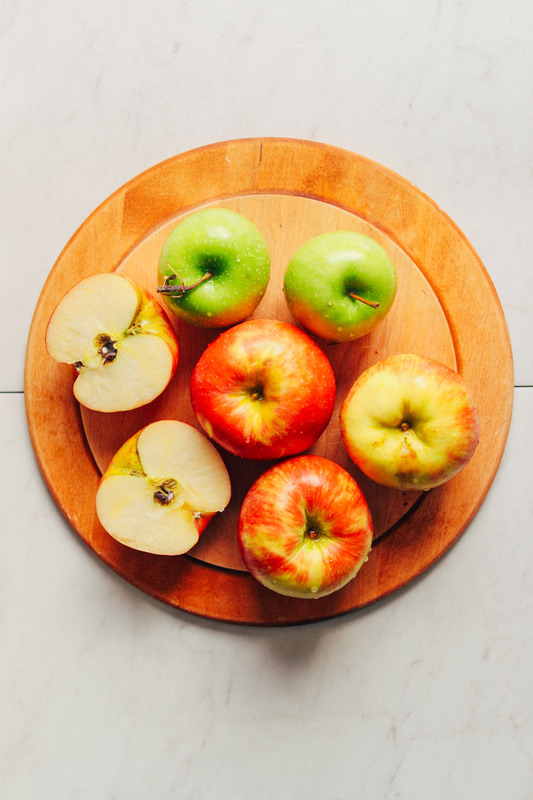 Kids love to topped their overnight cauliflower oats and oatmeal with these apples. I just love eating them anyway. Wow thank u for this recipe. Absolutely delicious. I topped my kid’s cauliflower oatmeal with your apples and she looove everything. I put protein on my cauliflower oatmeal, your apples, and almond butter. So good. I made this recipe earlier this week for a Christmas morning brunch. I ended up following the recipe primarily to a T, but I swapped the sugar for monk fruit & it came out amazing. And helped keep with the glycemic factor or it too. 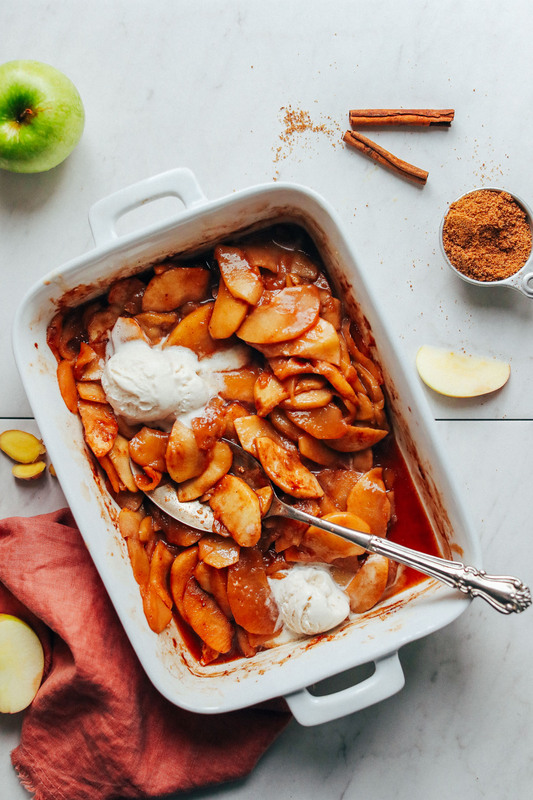 I had a bunch of apples that I wanted to use up and didn’t want to work too hard for a dessert—this recipe hit all the notes! It was super easy to make and tasted heavenly. It was just the right amount of sweetness and the apples caramelized beautifully. We ate it up with some vegan ice cream and I’m thinking of putting the leftovers on pancakes tomorrow. Great, easy, and delicious dessert! This recipe was great, but it was a bit too sweet for my tastes. Next time I will try it with half the amount of coconut sugar. Hi, I have been making many of your recipe’s, thank you! (5 ingredient cookies, no-bakes, curry soups) I’m just curious though, on your preference of coconut sugar to raw honey, is it a baking consistency liking or just a personal flavor preference? I can get raw honey a bit cheaper, so I tend to use it more. I’m so excited I found you and your apple recipe. Like others, I was looking for new ideas to make baked apples. I have it now in the oven. I’ll post comments and changes I made as soon as possible. I am delighted waiting for it with the most wonderful smell all around our home. Thank you so much for your recipe. I’ll keep on looking now though your other ones as well. Most times the best food we can make is the easiest with the least amount of ingredients. I will be around. For sure! We hope you love this recipe, Monica! We’d love to see what you cook up and if you post to Instagram, be sure to use the hashtag #MinimalistBaker so we can find it! My Granny Smiths completely exploded and turned to mush! The honeycrisp held up well though. What do I do wrong?? Hi Liddy! Granny Smith apples often will collapse and do turn to mush when fully cooked. (They are great for applesauce for that reason.) Many other apples will become soft but hold their apple shape – not Granny Smith. If you want them to hold their shape next time, I’d recommend slightly undercooking them; they will be a little “al dente”, but will still be delicious! Do you think this would still taste good without the cinnamon? I was planning on making the Caramel Apple Cheesecake with this topping for a Thanksgiving (Canadian) dinner this weekend but someone is allergic to cinnamon. Hmm, it won’t be “as” good, but yes it will still work. Compensate with more ginger and some nutmeg and/or cardamom. Do I need to use coconut sugar? Can I use just sugar and how much. Hi Paul! If you want to use another sugar in place of coconut sugar, I’d recommend brown sugar over white sugar. White sugar is not a good replacement for coconut sugar if you want a golden-brown color or caramel and butterscotch notes to go along with the sweetness. Hope this helps! Now I could make less of them, or I could save them and put them in the fridge. Do you think that’s a good idea? Or should I just make less? Hi Spela! You could freeze your leftovers if that is an option? Our baked apples keep covered in the refrigerator up to 3-4 days or in the freezer up to 1 month. What a gorgeous GF dessert. I’m going to make this for my nephew who can’t have flour and for me, because I struggle to bake without flour! Yes, that should work + this may be of help in doing so! 45 min was WAY too long and then 10+ after that? I did 40 min covered and 7 uncovered at 350 and it was so over cooked it was basically applesauce. If cooked 30 min and then 5 more it would be really good. It also depends on the apples you use, the altitude, humidity and your oven. No oven bakes exactly the same. This is why you check what is baking every so often. 45 minutes is not way too long for the author, obviously. I followed the recipe as written when I made these for a spring brunch today. They were delicious! So glad I tried them. Glad you loved them, Gale! I just made it this morning and halved everything. Including the cooking time. It is PERFECT! I used Morena cane sugar as well. Thanks so much Dana, this will be an often breakfast recipe from now on. how would you incorporate oats into it? Delicious with no sugar at all for those like me cutting out out all added sugar. I did use all red apples but will try again adding some green. All other measurements stayed the same..I did use the optional melted coconut oil and chose apple juice over water because I happened to have some juice on hand but water would have been fine, I’m sure. Great with plain yogurt and my husband had over homemade waffles. Exactly (yes modified) what I’ve been looking for to help fill the cravings for something sweet yet no sugar. Do you know if I can add sweet potatoes into this recipe? I tried a variation of this once before but I overcooked the apples and undercooked the sweet poratoes. Any advice for avoiding this? Dana, this was my first time baking and using your recipe. Cooking, baking, and following recipes was not my favorite; partly because I wasn’t good at it. After having a successful with this recipe for Thanksgiving (literally both houses finished all of it! ), I’m back on your page for more fun. Your easy, unique, and healthy recipes (having all three in one place is unseen) have changed my perspective on cooking/baking! Keep sharing and spreading your love and passion. It is highly appreciated! If you have any other advice for a newbie feel free to share :) !!!!! Thx for this recipe! I wanted a lighter dessert for friends coming over one evening and made this deliciousness … I was such a hit in my house that I’ve been making it weekly ever since! I refrigerate leftovers and have the baked apples cold with yogurt for breakfast or a snack. I also warmed leftovers up alongside pancakes one morning for breakfast and it was glorious. I haven’t made it with the cheesecake you posted but I plan to. Thanks again! Yum! Delish! I subbed in the maple syrup because it was on hand. Thanks! Did you sub 1:1 with the maple syrup? Fabulous recipe! I made it last night and used some for layering chia parfait and also served it with coconut yogurt and your delish coconut-almond granola. Funny thing, I completely forgot about the sugar-did not have much anyway so I added all that I had at home, probably 3TBS in the last 15 mins and it turned out sooooo good my man wants me to make it again like ASAP. Thanks for another keeper Dana, I will now send it to my friends too. I will make these again but without sugar. Way too sweet. I only cut up a total of 5 apples due to time and my baby needing me. I used all the recommended ingredients for this recipe, even got all fancy and used fresh pressed apple juice. Turned out p-e-r-f-e-c-t! Not too sweet either. Tomorrow I’ll be making the vegan cheesecake tart to go along with this. ? This is very good! I made it as written for the first time, and served it to guests! I eat paleo and don’t normally eat much sugar; next time I’ll cut the sugar in half. I was a bit concerned that the arrowroot flour would give it a glue-like texture, but it didn’t at all. I will make this again soon! Is there a substitution for the lemon juice or is it noticeable without it? I forgot to get this at the store. Hi Meagan! You can substitute it with an equal amount of lime or orange juice! I made this and it was wonderful! I didn’t have corn starch so I substituted it with whole wheat flour. I also didn’t have the lemon juice so I used a lime and added a little vanilla extract! I made this. Was super easy and hit the spot for something for fall. This was sooooo good. I used 2/3 c coconut sugar but will use half of that next time as I think it will be just as good (typically I don’t eat sugar). I also used 2 T unsweetened crsmanberry juice instead of water/apple juice. One problem: it only made three servings. ;) ;) ;) (ok, so perhaps I overdid it). This recipe is a keeper. I made these again tonight and used 1/3 cup xylitol instead of sugar. Used unsweetened cranberry juice again but added a bit extra during the last 15 mins if baking. Hi Jan! That should work fine! SO GOOD! Probably would use less sugar ~1/3 cup sugar next time, but #noregrets! I left out the sugar entirely and added raisins and vanilla essence. Stirred through some maple syrup in the last 5 mins and added some toasted oats and soya hazelnut yogurt to serve. Easy and endless variations. Made this with water, and cut down the sugar to 1/2 cup but way too sweet, even my kids thought so. I think I might try it with 2 tbsp of sugar and see how it goes instead. Otherwise a super yummy treat, especially topped with a bit of nada moo vanilla ice cream. The best!!!! It is so so good and I have shared it with so many friends! Thank you guys so much for your recipes! I made this last night & took it to a potluck for dessert with ice cream. It was a huge success!! Delicious just as the recipes says! I made this over the weekend for my husband and some friends and it was a hit! I used pink lady and Granny Smith apples. Also used regular sugar since that’s what we had on hand and Breyers vanilla ice cream. Will definitely make again! Do you think leaving out the coconut sugar entirely would be too drastic of a change? I’m wondering if the recipe would still be yummy/work well since apples are fairly sweet on their own! Thanks! Hi Annalisese! Yes you can, but it may be more tart! This is a great recipe. Simple. My can-eat-anything-and-does husband, liked it! I used about 1/2 c raw brown sugar, and it made a nice, thick syrup. Might try even less sugar next time. Thanks! I made this last night and me and my dinner guests all agreed it was incredible! I am not a big fan of pies (I know, I know) because of the crust. So this was PERFECT for me as it was like a delicious pie filling without the crust! I will make this again and again. I’m making these this morning and halved the recipe. Do you think that the cooking time will be less? Also, tiny thing – on the last line of your directions it says “Add a bit of water if the “caramel” sauce is too quick.” I think you meant to say “thick” instead of “quick”. Thanks for the recipe! Can’t wait to try it. Hi Juliana! Thank you for letting us know we will fix it! It will be slightly less cooking time, I would keep an eye on it! 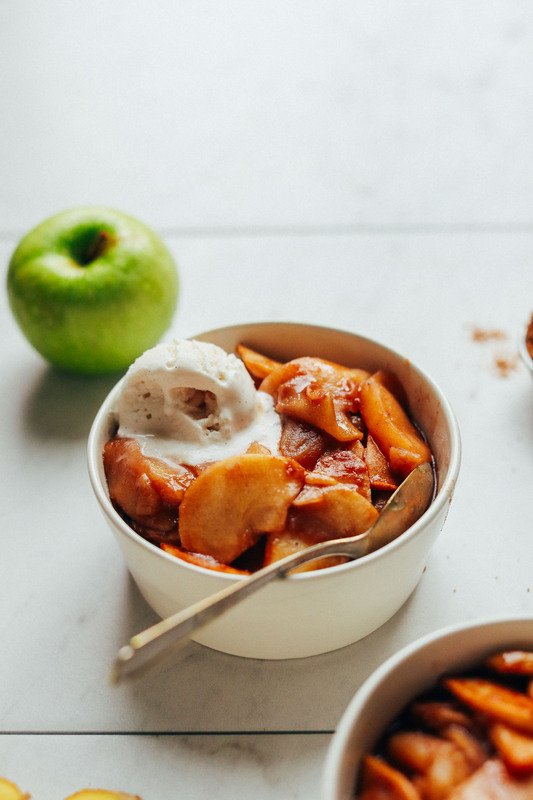 These baked apples look incredible! I literally came to your website specifically looking for a baked apple recipe! I made this and it was soo yummy. I only had 1/3 cup of coconut sugar so I used 1/3 cup maple syrup also. Brilliant! It’s not fall in Australia (our autumn) but this was fantastic for midweek family dessert with natural yoghurt to serve. Thanks! It would be absolutely wonderful if all the recipes would also be shown without sugar. The sugar fix is obviously the big part of the market but it is not a healthy option and the recipes without sugar are infinitely more flavorful. Or you could just leave out the sugar all on your own (What an idea! ), instead of telling others how to run their site and making blanket declarations about what tastes good, which is subjective. What a delicious-looking recipe! 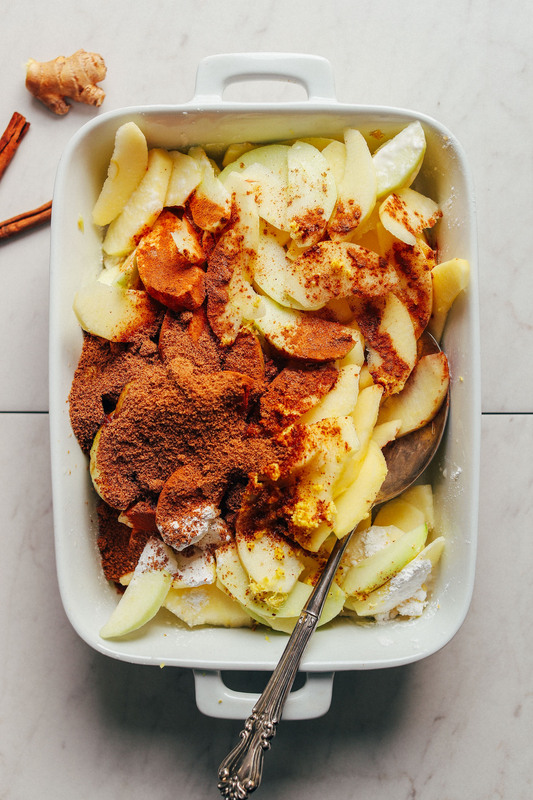 I love apples that have been baked with cinnamon–even alone! Would you reckon that a mix of apples, pears, and even peaches would work? Thanks! I do! Peaches will take less time to bake though, so check the baking time halfway through. peaches also won’t likely need to covered as they’re already quite soft. Just a thank you from a new vegan. Everything I have tried has been good, as well as easy. So thank you. We are hosting a fall bridal shower at work and this looks perfect! Can I make this in a crockpot? I don’t have access to an oven at work. If I can use the crockpot- what is your cooking recommendation in terms of heat/time and recipe adjustment? Hi Tali! I personally don’t use a crockpot and can’t say exactly, but I’m guessing if you cooked these on low for 6 hours, that might work? Let me know if you try! Tali, I made this in a slow cooker yesterday! I used 7 apples, on low for 6 hours, and the apples were falling-apart soft–we used them as an ice cream topping and got 7 or 8 servings. If you want firmer apples, check at 4 or 5 hours on low? FYI: I left out the 3 T. apple juice/water, but because of the slow cooker, the “caramel” was still really liquidy, so you may want to add some thickener at the end. But I used brown sugar, so maybe a different sugar would have made a difference there. Also, in the slow cooker, the ginger flavor got much more intense (like most spicy flavors in slow cookers), so you might want to cut back a tiny bit on it. Your calculation of 55 grams of sugar per serving seems off to me – seems like it should be more like 22 grams. I am sensitive to sugar and when I saw 55 grams I was disappointed — but 22 sounds quite a bit better! I think Dana’s calculation is including the sugar content in the apples! Ahh, ok — makes sense! I’m thinking you’re forgetting the sugar from the apples themselves. Also, I personally subbed half the coconut sugar for 1 packet of stevia, so that drastically reduced the sugar content! Yes, you are correct, thanks. It sure seems like a ton of sugar! Do you think this would be good with your Coconut Baked Oatmeal? What a about adding a handful of raisins for sweetness? And a handful of chopped walnuts or pecans for crunch? Can’t wait! Do you think this will reheat well? Absolutely. Reheat in the oven or microwave (whichever you prefer) until hot. Yes please! This recipe is perfect for this time of the year, I always used to make an apple crumble but it was way too much work. This is much easier and probably much healthier. Can this dish be made with pears too? I would think so, yes! Let us know how it goes! Wondering if you could add some rolled oats for the more crumbled affect? Hi Lindsay! Yes you can! This looks fantastic! However, I’m not a fan of coconut. You mention that I could sub maple syrup for coconut sugar. How much maple syrup should I use? Thanks! I would say start with 1/4 cup total! Coconut sugar. Not oil. The oil is optional. No need for it! And coconut sugar doesn’t really taste of coconut, but maple syrup would be delicious too! I substituted 1/2 cup of maple syrup and it came out amazing! Does this recipe require apples? Could it be made without them? Thanks love your stuff. Bahaha! You win the internet Janet and Dana! Does this absolutely require the added sugar? Could it be made without sugar at all? Hi Haley! I would recommend adding *some* sweetness, perhaps in the form of stevia or a few chopped dates! another option I’ve seen is using frozen apple juice concentrate and boiling it down to a denser juice and using that as a sweetener. Just an idea…?! I make apples on the stove top with just cinnamon and they get sweet when sauteed.